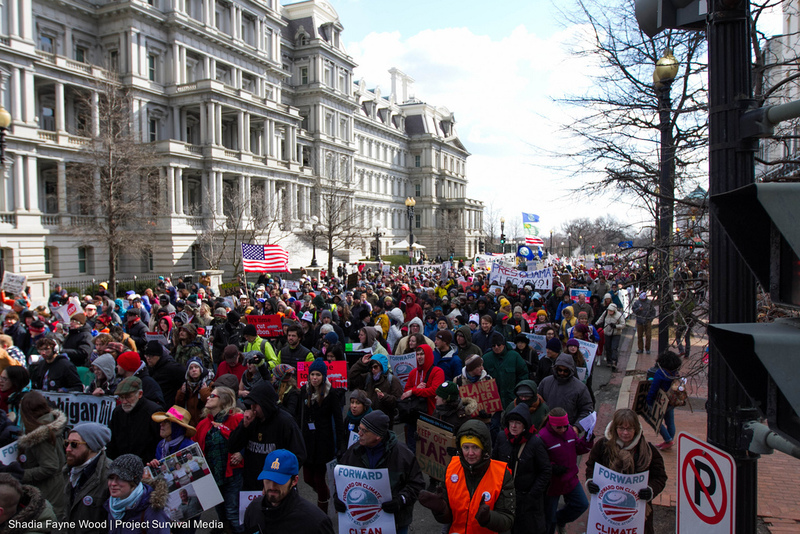 An estimated 40,000 people gathered in Washington, DC, on Sunday to urge President Obama to act against climate change and the Keystone XL pipeline. An estimated 40,000 people gathered on the National Mall in Washington, DC, on Sunday for the Forward on Climate Rally. Environmentalist groups 350.org and the Sierra Club participated in the rally and subsequent march to the White House to urge President Obama to take action against climate change and reject the Keystone XL pipeline. The event appeared to divide activists into two camps: those who see Obama as an ally with whom they simply need to plead with often and diligently enough so perhaps the president will yield to their demands, and those who see their roles as dissidents who need to force Obama’s hand by participating in blockades and other forms of direct action. Tar Sands Blockade, a group of residents and climate justice organizers who use nonviolent direct action in an attempt to halt the construction of the Keystone XL pipeline, addressed concerns that 350.org and Sierra Club are simply opportunists unwilling to get their hands dirty utilizing strategies like direct action. “If you could do it nonstop, it would take you six days to walk from Henry David Thoreau’s Walden Pond to President Barack Obama’s White House. For the Sierra Club, that journey has taken much longer. For 120 years, we have remained committed to using every ‘lawful means’… Now, for the first time in our history, we are prepared to go further,” said Brune in a written statement. Brune quickly made good on his word when he, along with McKibben and about fifty others, were arrested last week protesting KXL in front of the White House. “President Obama holds in his hand a pen and the power to deliver on his promise of hope for our children. Today, we are asking him to use that pen to to reject the Keystone XL tar sands pipeline, and ensure that this dirty, dangerous export pipeline will never be built,” Brune said on Sunday. Simultaneous rallies were held in cities all across the country, including in Los Angeles where a coalition of more than ninety groups organized one of the largest climate change rallies ever staged in the city, according to the Sierra Club. Read George Zornick’s report on the Sierra Club’s first participation in civil disobidience, a precursor to Sunday’s monster rally.